Shavuot is that holiday that has always been associated, food wise, with cheesecake. Mother’s Day, candy and flowers. Quite frankly, I’m not a fan of going with what’s expected. While fine as go to gifts, celebrating the holidays that celebrate your mother and the Torah deserve something special. I say, go big or go home (or at least to the most decadent recipe you can find). With today being Mother’s Day and only a few weeks to go before the holiday please make time to test the following recipes for serving your friends and family. They are both SUPER simple and can, should you choose to accept the premise that everyone deserves delicious every day be created in less than 10 minutes and served for breakfast, lunch, dinner or just because!!! FYI: I have no clue as to the origins of these recipes several readers sent me variations of both and I created my own mash ups. Place about three heaping tablespoons of the cream cheese mixture in the center of each wrapper and spread it out, diagonally in a log towards 2 of the points of the wrapper. To make the roll shape, bring the corner that doesn’t have the mixture near it up over the mixture and tuck it in. Fold the two sides to you up and over and gently tuck it in. Fold in the sides and then roll the wrapper, tightly towards the remaining point. Use a dab of water on the point to the roll together. Place on a cookie sheet point side down. Repeat with the remaining filling and wrappers. Heat oil in large saucepan or deep fryer. Fry 2 or 3 at a time about 2 minutes or until lightly golden browned. Remove from the oil and drain on paper towels. Serve warm. 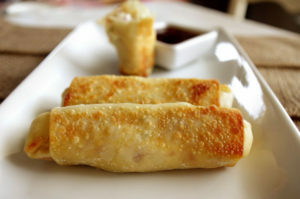 Note: for appetizers you use won ton wrappers and form triangles instead of egg roll wrappers. Warning!! These can be addictive!!!! Heat your waffle iron and spray the non-stick spray on top. Slice the doughnuts in half and place some of the chopped candy bar of choice on the bottom half. Put the top half gently over the candy and place the donuts on the waffle iron. Gently and slowly push the top of the waffle iron over the doughnut and push to close. Cook about 1 minute, just enough time to melt the candy. 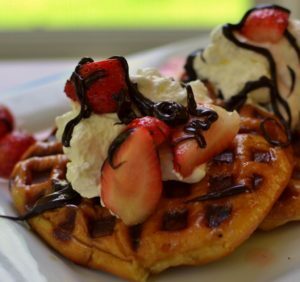 Remove from waffle iron and serve with sliced strawberries whipped cream or ice cream or just all by itself! Makes 6 but seriously, you’ll probably need to make more.